René Lacoste entered the legend of tennis when he and his teammates "The Musketeers", stole the Davis Cup away from the Americans for the first time in 1927. Not forgetting his three French Open victories (1925, 1927 and the Roland-Garros stadium in 1929), his two victories in Great Britain (Wimbledon 1925 and 1928) and two U.S. Open titles at Forest Hills (1926 and 1927). René Lacoste was born in France on July 2, 1904 and died on October 12, 1996. The true story of the "Crocodile" begins in 1927. René Lacoste liked to recount how his nickname became an emblem recognized throughout the world. "I was nicknamed 'the Alligator' by the American press, after I made a bet with the Captain of the French Davis Cup Team concerning a suitcase made from crocodile skin. He promised to buy it for me if I won a very important match for our team. The public must have been fond of this nickname which conveyed the tenacity I displayed on the tennis courts, never letting go of my prey! So my friend Robert George drew a 'crocodile', which I then had embroidered on the blazer I wore on the courts." An attentive spectator at René Lacoste’s Davis Cup matches was the winner of the British Women’s golf title, Mademoiselle Simone Thion de la Chaume, who soon became his wife and constant support. 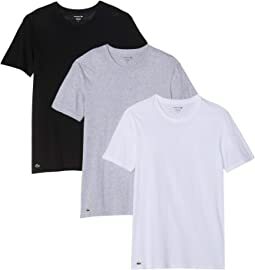 In 1933, René Lacoste and André Gillier, the owner and President of the largest French knitwear manufacturing firm of that time, set up a company to manufacture the logo-embroidered shirt. The champion had designed this for his own use on the tennis court, as well as a number of other shirts for tennis, golf and sailing - as can be seen in the first catalogue, produced in 1933. To the best of our knowledge, this was the first time that a brand name appeared on the outside of an article of clothing - an idea which has since become extremely successful. This shirt revolutionized men’s sportswear and replaced the woven fabric, long-sleeved, starched classic shirts. 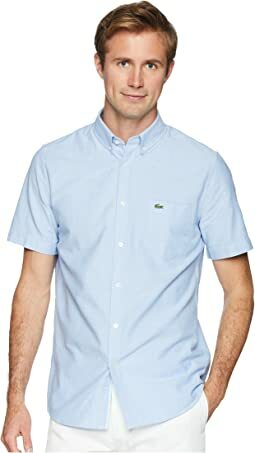 The first Lacoste shirt was white, slightly shorter than its counterparts, had a ribbed collar, short sleeves with ribbed bands and was made of a light knitted fabric called "Jersey petit piqué". Today, it continues to offer the same quality, comfort and solidity on which it built its name and which constitutes its uniqueness. As an enduring legacy, the Lacoste brand has widely expanded over the years. 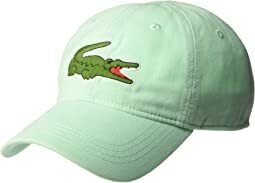 Its famous crocodile emblem can now be seen on shoes, eyewear, watches, bedding, bath towels, bags, accessories, kid's shoes, as well as apparel. I ordered them and they were her in one day plus they are a true fit size 13 and the quality represented the Lacoste brand. Thanks ! These are waaayy too narrow. We bought 3 pairs of size 13 of different shoes. This is the pair that he couldn't even get his toes into, let alone his foot. Way to small in size, and extremely narrow. Look nice though, it's just the fit is all wrong. I wish I knew that ahead of time. Very poor quality. Would not buy again or recommend to. Love the big crocodile logo and all the summer colors they rolled out with. Fits well. I've always been a Lacoste fan. You will not regret. The size and fit (7.5M) was perfect. The shoes are comfortable and stylish and will look great with jeans and ankle pants. I have a similar pair in Skechers and love them, so I know that I will love these. I absolutely love these. They're plain without being boring, and look sleek and modern with a skirt or jeans. 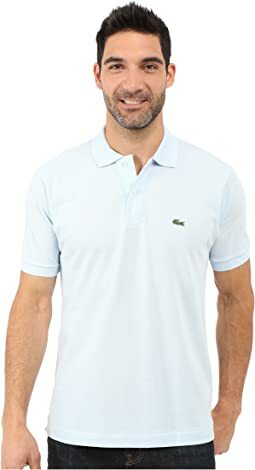 I looked a long time to find this particular look and have had Lacoste sneakers before that were wonderfully comfortable but that were just getting too worn to wear well. These last, and they're worth the price. Highly recommend! I got the ones with the pink gators. Could not resist them. They are comfortable and make good pool sandals. The pink is subdued. Not as bright a pink as they look in the picture. The style and size are okay but the medium width is too narrow. I don’t think you should have unisex sizes for your shoes. This is the only t shirt my husband will wear. He likes the material and the fit isn't too tight or too loose. 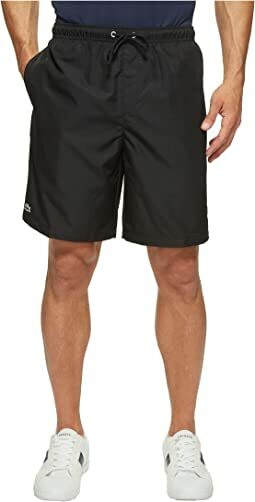 I bought him the 3 pack because I get tired of seeing him in only black t shirts. Comfortable but very loose. I'm a womens 7.5, wider feet, and ordered an 8 - too large all around to stay on. Had to return. Really cute and well made shoes that will go with anything. I normally wear an 8.5 in regular shoes and a 9 in running shoes. After reading other reviews, I ordered one size down, but that was a mistake. I would say these are true to size. If you are between sizes, maybe go a half size down. The 7.5 in these was way too small. I think my normal 8.5 would’ve been perfect. I will say, the leather is a bit stiff and would take some time to break in. I would definitely need to wear a decent sock with them. Great shirt for any occasion. True to size and quality material. Would highly recommend this shirt for anyone looking for a classic short sleeve button down. Order only 1/2 size down, not full. 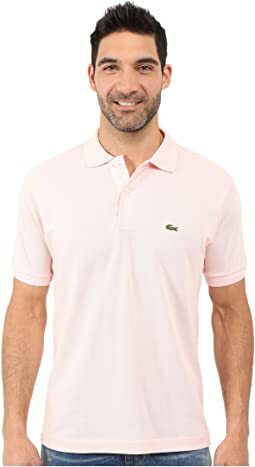 I ordered a full size down after looking at the Lacoste website (which indicates that a 7 is a Euro 38)-- that was a mistake. I normally wear an 8 US/38 Euro, in these shoes I wear a 7.5 U.S. I wear an 8 1/2 and ended up returning these because they were about a half size too large. Had they been comfortable, I would have exchanged them for an 8 but as another reviewer stated they cut into your feet. They sure didn't feel like leather because they were stiff and hard as a board. I liked the style of the shoe, but they appear to be a half size smaller, than marked. I used to own a pair of the LaCoste Girons several years ago and wanted a new pair. Glad to see LaCoste coming out with the Girons again. Right now, since they're brand new, it'll take a few weeks to break them in. But glad to get them. Shoe feel very cheap. No good support. The fit was ok, although a little narrow. Would probably stretch over time. I returned them because they are extremely squeaky on tile floor. I did like the style, that's why I bought them. The shoe is quite narrow, so if you have regular feet it might be uncomfortable. Quality control seems to be non-existent, I received a pair with varying colors. Waste of my time and Zappo's shipping money. I love these shoes! They’re great quality. I normally wear a size 10 and purschased a size 10 in these. They slip a little bit, but I just tie the laces tighter to keep my foot in. I also have a very narrow foot and they feel wide to me. Despite that, they’re still super comfortable and I’ll be wearing these around Europe this summer! well made, cute and felt good when I put them on, but when I walked, the heel slipped up and down, so they won't work for me.